Gigi is the first offspring out of Golden Sovereign, a Legacy Gold son co-owned by Maple View Farm and Cas-Cad-Nac Farm, and she’s just what we expected from this ribbon winning breeding combination (Mom is a blue ribbon winner herself)! Gigi has shown in halter at the very large and competitive North America Alpaca Show (twice), MAPACA Julibee, Empire Alpaca Extravaganza, the Green Mountain Alpaca Fall Spectacular and the Maryland Alpaca Show as well as in shorn at the CNY Classic, bringing home ribbons from all 7. Gigi’s fiber is fine and crimpy. The EAE judge said she had the best confirmation in the class and will make a great female to have in a production herd. Gigi’s 2nd placement at the Green Mountain Alpaca Fall Spectacular in a large and competivite class of 12 was particularly exciting as she placed behind CCNF Moonlight, also out of Golden Sovereign and a multiple color champion. The judge raved about Gigi’s awesome density. In both of the 2008 shows, where Gigi showed as a yearling, the judges commented on her soft handle and “buttery” feel. They also described her as dense, fine, even across the blanket and structurally sound, making an excellent production animal in a program breeding or looking for color with strong genetics. Gigi has developed into an alpaca with all the attributes we look for in a female. 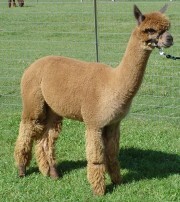 In 2010 Gigi gave us a gorgeous girl out of Revolution and a dark fawn male out of our own Calix in 2011. In 2013 Gigi once again produced a beautiful male. In 2015 Gigi produced a white female our of Quarry Ridge’s Grand Slam! She is currently open and can be bred for a new owner.